Home/Roger Federer/Is Federer Mentally Tired? After Roger lost in the semi finals of Shanghai to Murray I got a number of interesting comments on my recap post that raised the question is Roger mentally tired after having such a great year and does he really care too much about ending the year end number one? After watching highlights back from the Lu, Wawrinka, Cilic and Murray matches in Shanghai I think saying Fed is tired mentally a fair conclusion. Apart from the Lu match Roger really wasn't with it, he wasn't serving great and could even have lost to Wawrinka. I suppose you can say he was also lucky Cilic made a ton of errors too as that might have worked differently had he not. I won't go as far as saying Federer was all over the place but if Cilic had brought his A game and Wawrinka not choked away a lead then the Murray match might not even have happened. It's just that Roger 3.0 keeps finding a way to win but are all those matches this year where he's ground out the win taking there toll mentally? As crazy as it sounds Roger could end up playing the most matches in a season he's done for some time. So really there's no slowing down despite him needing to manage his body more effectively these days. A lot of matches this year have needed great mental strength dating back as far as Rotterdam where Roger could have easily lost to Davydenko. I think these matches have maybe have taken their toll and Roger isn't as fresh as he was at the start of the year. I would love to finish No. 1 for the end of the year, for that, it's going to take a great stretch again, winning Basel, Paris and London I assume to give myself a chance. We'll see how it goes. I'm relaxed about it. I'll give everything I can. I want to get through this season well and finish strong. But it's not the number one goal right now. Right now, it's to manage my schedule, hopefully be in good shape for Basel, then kind of go from there. The goal was to become World No. 1 this year, which happened, not the end of the year. But if that happens, that's a bonus. I think his quote from the Murray presser says it all in that he's not concerned about ending the year end number 1. In fact, why risk burning out and getting off to a poor start in 2013? Sounds like the most sensible play to me and that was reflected in the match against Murray, he couldn't seem to get started, it was close in places but in the key moments Roger just made some mistakes and didn't have that edge we've seen all year. I'm not saying it was a conscious thing in that he chose to not play well, but more just a mental thing that he wasn't able to move up a gear. I guess it's a smart move by Roger in the end though, Djokovic and Murray spent over 3 hours on court today in the Shanghai final and Murray looked dead at the end struggling to move and limping. I know some fans are disappointed that it looks like Roger isn't really looking to grind out the year end number 1 but what would it achieve? Is the Berdych Match to Blame? If you look back the dip in form all stems from the loss to Berdych at the US Open. I said at the time that match really annoyed him and it looks as if the after effects of that match are still lingering. The fact he had such a good chance of winning annoyed him more than anything I think and then finding a way back into the match in the third set but ultimately falling short in the fourth was a big blow. Maybe playing the Davis Cup straight after wasn't the best choice as it didn't give him time to recover fully but then again he got to spend time with his friends which you'd think would remove the Berdych match from his memory. Whatever he chose to do after the US Open though that doesn't stop the Berdych match being a shock to the system. Perhaps some time off is the best thing for Fed now so he can relax then hit the practice courts. Interestingly Roger also said in his presser that he feels like he's lacking practice and isn't happy with his game from the baseline. Seems like he is already thinking of next year. The best thing I think is for him just to relax in these upcoming tournaments, just play his natural game and see what happens. There's no real goals now for this season so he just has to play free and win or lose then it's no big deal. What do you guys think? Is Roger mentally tired after the events of the season? Yeah, I think so. Roger didn’t care about the final outcome in Shanghai, probably he just wanted to secure 300 weeks in No.1. I dunno about him not giving it his all, I think it was more a case of wanting to but him not being able to summon his A game. Don’t think he’s going on court wit the aim of not trying, just he’s not working towards an end goal. Hard to focus. He’s had a great year but it’s been long and gruelling. I think he can’t really make No. 1 at the end of the year a target because so much of it is out of his hands. Even if he has a near perfect end to the year he will gain little or no points. It all depends on how well Djokovic does. However, I do think he will expect of himself a strong finish to the year. Indoor courts suit him and I can’t imagine him turning up to Basel and giving a half hearted effort. A good week there may well springboard him into Paris and London as it has in 2010 and 2011. Regardless of what happens though I think this year has been super and none of us will forget it. Yeah Basel hopefully can inspire him. I think he might withdraw from Paris. I think thats a very fair analysis. He has had a fantastic season playing more than usual at masters level and obviously combine that with olympics and davis cup he was always going to feel it towards the end of the season. Personally I would love to see him win one of either paris or london, that would be great but obviously quite hard. Looking ahead to next season I think i would like to see him carrying this seasons great form at masters leve to then go into grandslams full of confidence. Who knows if Nadal isnt back for a while I think federer should really go for the clay season as he would have a really good chance to get those masters titles he doesnt have and maybe even another RG? Personally I would like to see nadal recover, mainly to give muz a good thrashing and send him back to number 4. I will enjoy the end of the season, knowing that whatever happens feds has acheived his goals and I’m looking forward to a great run at the oz open and another fantastic season for federer. Allez! I want to see a good showing in Basel as I prefer that tournament to Bercy and WTF. Then just focus on next year. He has those Exhos to play in Brazil too, hopefully they ain’t energy zapping. Nah, I think he’s just not trying, since there’s not much of a point. I plan to write about this on my blog, but I think that Federer is letting other players win tournaments. Federer entered Shanghai to keep his number one spot, and he did after winning against Wawrinka. After the Wawrinka match, he didn’t really need to win the match anymore, but he still won against Cilic. Maybe Federer felt bad for winning against Roddick 3 times at the Wimbledon finals, so he doesn’t want to repeat the same with Murray? Just my hypothesis. Sorry if this offends anyone. Ah come on that, that’s ridiculous. Letting other players win tournaments? lol Never in a million years. Oh, no, no, no! I can’t even imagine Roger thinks like that. That is out of … I don’t know what. This is just ridiculous !!!!! I think you’re right. He didn’t really seem to be comfortable all week in Shanghai, which was sort of surprising considering that he had a few weeks off coming into the tournament. I wouldn’t read too much into this loss though, because I think that he’ll be more prepared for Basel which should help him going into Paris and London. It would be great to see him end the year as number one after the great year he’s had, but unfortunately I don’t think it’s going to happen. Djokovic is playing very well at the moment. I hope Federer can finish the season strongly, even if he doesn’t finish at number one. Hope so! Djoker is looking good for sure. I have no expectations for the season now though, winning matches is just a bonus. With a Major, 4 Masters, WTF, 3 500 Titles = 9 titles since this point last year, Roger has defied the laws of aging and has deserved the #1. 300 weeks will probably not be even contended within our lifetimes! Roger is tired IMO, and I think he should play conservatively because there are Grand Slams to be won in 2013. Did you see Roger’s brilliant shot yesterday? I love the commentary: “Call 911, 2 men just broke out of jail!” 😉 At age 31, he’s still doing it! What do you think of Rafa? Basel, here we come!!! Haha yeah Robbie Koenig is funny, one of my favourite commentators! I think it’s not always easy to tell what’s going on with Federer. After seeing someone else mention it, I noted in the replay of the Murray match that Fed had a bit of a limp. Something was off in his gait, and a leg or foot problem could easily explain the wonky serving and slower movement on the court. He said he was aching from his first match when he played Stan, so it’s possible he just overstretched something and couldn’t play at his top level. I do think you are right about the number 1 ranking. Federer always tries to put his body and health first, and make sensible choices. He could totally kill himself to win every tourney and still lose number one. There’s no point to that. Like he said, obviously it’s awesome if he *can* retain it, but I’m guessing his goal is the same as it was the last two years. Play well, stay close to the top guys, and if you lose number one you’ll still be close enough to nab it back again. Also, I think Roger is looking at the big prize now, the WTF. I haven’t watched the interviews but my guess is he is going to sit out Basel. He should sit out Basel. If he plays both Basel and Paris, he will be running on empty at the O2. I don’t want that to happen. Rog is planning to play all three. I highly doubt he would skip Basel, unless he was hurt. His hometown tourney is very important to him. I do think he wants to win the WTF again especially, though. Yeah I can’t see him skipping hometown tournament. People will have been looking forwards to that all year. Paris is a maybe skip for me. Yeah I heard that too, I didn’t really see the limp though so not sure on it. Maybe a recurrence of the hip problem from Rome. I like that philosophy – play well, stay close and the rest will take care of itself! There seem to have been a lot more high-profile matches this year where he has tanked. I’ve watched a lot more matches than in recent years where he just doesn’t seem to have been able to up his game, which has been terrible. I know he has had a great year but his performances against Djokovic in Paris, Murray at the Olympics, Berdych at the US Open etc. just haven’t been in keeping with what we’ve come to expect from Roger. When I say ‘tanked’, I obviously don’t mean ‘intentionally tanked’. Not true. It’s not called “tanking”, it’s called “investing in the future”. The Berdych match was a shocker, sure. But his loss do Djoker at Paris? Hell No! He knew he had the grass court season coming up. He prepared for it perfectly and got the perfect result, well, almost. Wimby, The No.1 record and nearly a gold (had it not been for that stinker of a game he threw in serving for the match at 5-4 vs. DelPo). I look at his Shanghai elimination as a blessing in disguise. It will reward him in near future. Hopefully it will reward him in the future, good way of looking at it. Managed against Wawrinka kinda though, maybe just taking its toll. I think with a bit of rest then he will be back to winning ways. I do believe he is a little weary and I said so as much on G+. As inhuman as he appears, Federer still has his mental/physical lapses, particularly with his long line of career achievements, his position is unprecedented and it’s easy to fall into that trap. How many past champions have burnt out, become satisfied, or simply been unable to achieve greatness again? The answer is everyone. NO ONE has been able to sustain the excellence that Roger has. While I do think he is mentally fatigued, I also believe he will overcome this hurdle. Will it be tough as hell? Of course! But this is Roger Federer we’re talking about. It only gets harder from here, but it’s a challenge that only he has ever been in a position to face and he is the only one qualified to meet/exceed that expectation. Even if he doesn’t finish No. 1 year, he’ll have his chances again next year, and the year after…. Next year, I think we could see some good stuff again. Year after though I think is too much of an ask. If Fed is slamless next season then I think he will look at retirement. All you Roger fans, be practical and recalibrate your hopes of the Year end number one. If I were a betting man, I would say it’s not going to happen. Djoker just has to turn in decent performances from here on (I mean, his tennis, not his buffoonery on that stupid Gangnum style song) and he is guaranteed the No.1 year end ranking. play basel,paris and WTF as well.no doubt guyz. I do believe Roger is feeling the effects of a long season. This period of time right now reminds me of the end of 2009. Three years ago, he had come off a great summer winning the French and Wimbledon, and then suffered a hard loss in the US Open final. Then after that he lost in the Basel final to Djokovic, went out to Benneteau in Paris and then went out in the semis of the WTF. Not saying Roger is doomed to that bad an end to the season, but you can see the similarities in the years. Right now, I think the best thing to do is to keep healthy and try to win Basel and the WTF. He could sweep all three again, of course, like he did last year, but the chances of that are unlikely with Andy and Novak looking very strong currently. Losing the #1 is really no big deal. I tweeted earlier today that getting back the #1 at his age and surpassing the 300-week mark is the big achievement of this year along with winning Wimbledon. Finishing the year #1 would just be a bonus. He should be focused on the Australian Open next year, because he can certainly regain the #1 then if (when, likely) he loses it at the end of this year. All it would take is a Djoko SF loss and a Fed win and he could recapture it. Yeah there are slams up for grabs next year. I think it will be much tougher to win one next year for Roger but not impossible if the draw opens up so may as well focus on that. Also, Jonathan, Roger is 64-9 now so he’s played 73 matches already. I’d agree that Roger is mentally tired. We all know that his goal was to get back to world number 1 and win another slam. He did both of these things and he has racked in the records as well. Most number of weeks at number 1, a record 300 weeks, equaling Sampras’ number of Wimby titles, an 18th slam over the age of 30, I mean, all of these things have been grand for Roger and us as Fedfans. What everyone is talking about now is just more glory. Roger got what he worked for, and now it’s just a matter of playing the remaining tournaments. I think more than anything else, he just needs to get as deep as he can into these tournaments to keep himself in shape for the world tour finals and his ranking in shape for 2013, not to end world number 1. At this point, it would all be the cherry on top if he could win a couple more titles or be the year end number 1. Overall, he proved so many wrong by achieving what he has at this state of his career, and it was really like he’s been racking in one title after another, and he’s been playing great. I mean knocking out Nadal in the semis of IW was one of my favorite matches, I must have watched it like 10 times. Beating Djokovic and Murray back to back at Wimbledon was pretty nice, and you can’t forget that epic Del Potro match at the Olympics. I most definitely agree that Roger is the one who’s burnt out at this point. Last year it was the rest of the big 4, but this time it’s Roger. I just hope that even with the exhibitions in December, that Roger can find a way to rest and enjoy his time off. At the same time, they ARE exhibitions – so it’s not like he’s going to waste tons of energy on the court. And it’s almost like a vacation because he’s never been to the places they’re going to on tour. Also, he’s not playing Abu Dhabi, so that’s a plus. I think one of the things I admired most about Fed this year was the way he adapted to winning matches from behind. It was awesome to see him handling dropped sets calmly, learning from them, and adapting his play in the following sets to take a match that he’d seemed in serious danger of losing. And the way he toughed out that Olympics match w/DelPo was extraordinary. If anything wore him down emotionally this year, it was definitely that one. Very good point, I kinda forgot about that match in the Olympics. Crazily emotional. But then he went and took down Cincy like it was nothing. I think the Berdych match hurt more for some reason. I think the Olympics match was more of an emotional strain…the extended tension of it, the knowledge that losing could easily have meant another 4th place finish. It ended blissfully for Fed, but that kind of thing still takes its toll. I think the high of medaling carried him over to Cincy. He was so freakin’ happy in that tourney, you could just feel how much he was enjoying himself. I do agree that the Berdy loss hurt more–he seemed so, so crushed afterwards. But when he breezed into Shanghai he seemed to be at peace w/everything. I felt like any mental distraction was more about all that extra security and his family not being with him. Those two matches were my absolute favorite! The best matches are when Roger is in a rut and he finds some way to get out of them. A true champion! Thanks for the comment Kelsey. Yeah I wonder if the Exhos are a good idea? Very big for South American fans though so kinda understand why he is playing them. Glad he’s skipping Mubadala Tennis Champs. Yes, it’s wonderful for his fans over there, and for Roger, since he’s never on that side of the world. I’m trying to see them as a positive – as a mini vacation. It’s not like exhos are like slams, ya know? All I remember from Abu Dhabi this year was everyone panicking when he got beat by Djokovic and Nadal … and then he went on that great streak from Rotterdam to Wimbledon. After several painfull loss (Murray, Berdych, Murray again), I now learn to watch Fed for just pleasure. If he lost, it’s OK, if he win, it’s a bonus. 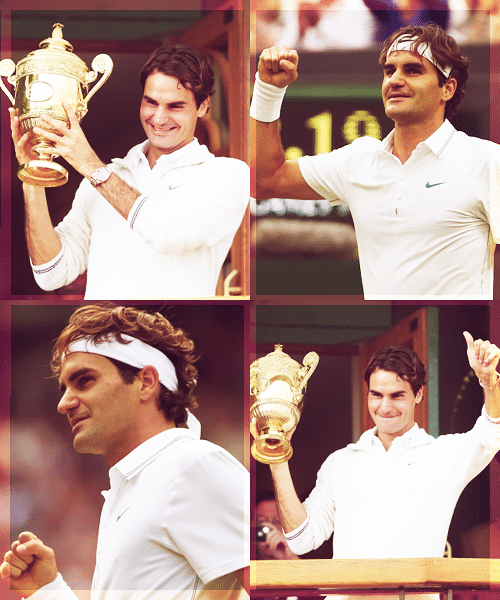 Man, he’s 31 years old, and still give his fans some magical moments this year (winning Wimby, back to No. 1, silver medal, winning Cincy with a bonus Djoker bagel, get to 300 weeks. But one thing for sure, he’s a truly a genius in tennis. And nobody knows what a genius can and cannot do, except another tennis’s genius. So, I still hope he will give us some beautiful surprises and magical moments in 2012. Thanks for keeping this blog alive Jonathan, a place where I go everytime Fed loss his match. Thanks 🙂 I think big things can still happen in 2013 but we shall see.